Heinrich Richter's family came from Bavaria and was related with the author Jean Pol Richter. Heinrich was born in Berlin and there he went to school. Without knowledge of his parents he went to Eduard Devient for acting lessons. He left home to become an actor and he his first engagement was in Posen in 1839. He continued his career in Rostock and Leipzig and in 1843 he appeared at the Burgtheater in Vienna. After a succesful time in Vienna he returned to Leipzig in 1844. When the revolution broke out in 1848 he was put on half pay. He married a daughter of the merhant Heinrich Mayer from Leipzig but early in 1849 he accepted an engagement in Munich. In 1851 Dingelstedt took over the Court Theatre and Richter didn't like his new boss but he stayed in Munich and under Schmitt and Perfall things went better. In 1878 his wife died and in 1880 he accepted a position as a teacher. In 1889 he was his 50th year on the stage was celebrated. His last performance took place in 1893 and he retired in 1894. 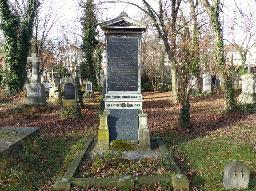 The grave of Heinrich Richter at the Alte Südfriedhof, Munich.